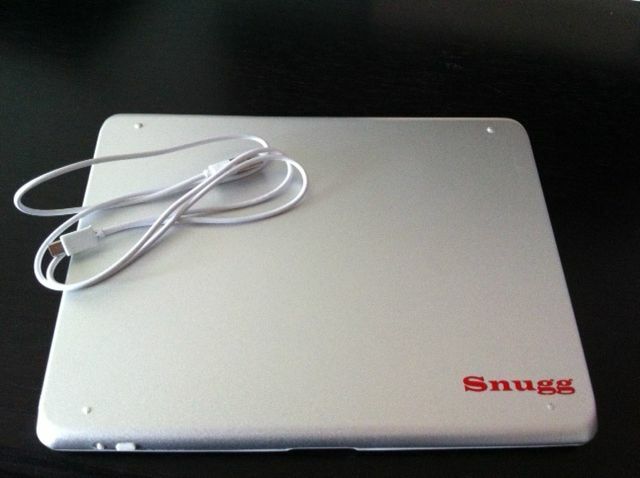 The Snugg ipad Case Review – Nomadic Gamers, eh! I was sent a free Snugg ipad case to review from the fine folks over at The Snugg, and since I’ve been really unsatisfied with the $60 one I purchased from Apple, I decided to try it out. It shipped very quickly (less than a week) and came in a nice clean box with instructions on how to use it, along with a cord for recharging. 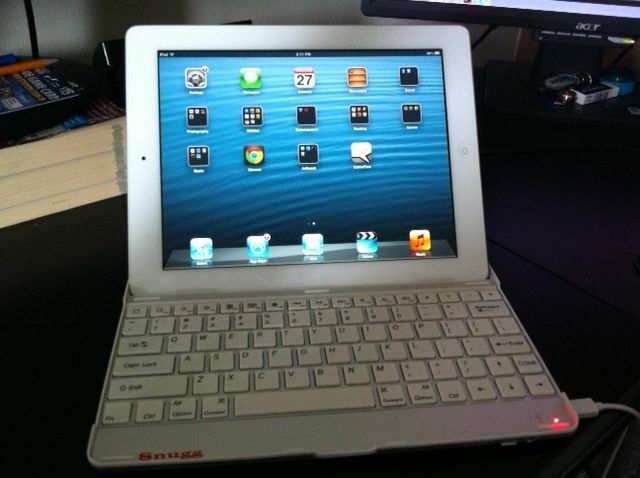 In specific I decided to review the snugg ipad3 ultra slim bluetooth keyboard case. I know this probably sounds silly, but I didn’t expect the case to actually come with a bluetooth keyboard. I have one of my own and I figured I would have to slip it into the case. This case comes with one along with a USB cable so that you can recharge the battery which lasts for approx. 55 hours of use. I haven’t had to recharge it yet, and I’ve had it about a week. The case is a hard plastic, which is much sturdier than the previous one I had been using. The ipad snaps into it easily and (go figure) snug (via the picture above). The case itself props the ipad open like a miniature laptop, you basically just prop it up against three small pegs at the bottom that hold the ipad in place. My only issue with the case is that these pegs don’t actually secure your ipad so if you were to use the case on an unstable surface that tilts, you could drop your ipad out of it very easily. If you’re using it on your lap and tilt the case backwards or forward it would eventually slide out. However, I don’t believe that this sort of case it meant to be used that way, so the chances of that happening are quite slim and would be something you are (hopefully) planning for. Using the case on a flat surface works best, pictured above I have it set up on my desk. I also used it just fine on the couch or coffee table or even in bed beside me. All of the components to this case are well made which I was pleased about. The USB cord is sturdy, the case has an off and on switch for the bluetooth, and gave separate instructions on how to sync the bluetooth keyboard up to your device. Over all I was pleased with this case – especially since the price point is lower than the apple triangle cover I had purchased with the ipad. My original case is incredibly flimsy, and gives practically no protection what so ever. As I mentioned above the only downside is that the ipad is not actually secured into the case, it’s propped up but as long as you’re not bouncing around I don’t see it being that much of an issue.